The grape variety Moscatel de Alejandría is grown in the sunstruck area Axarquía (Eastern part of Málaga), a mountainous region with impressive rugged hills on soils covered with decomposing shale. The climate is warm and dry. The grapes are picked manually an kept in crates. Only free-run juice is used, obtained by means of a pneumatic press and submitted to a cold debourbage. The clean must will then ferment in stainless steel tanks equipped with temperature control. The ideal temperature for the fermentation process is about 17º C. A natural alcoholic degree of over 10 degrees is obtained from the partial fermentation of the must, before its “mutage” or fortification up to 15 %. ”Mutage” it the process of adding wine alcohol to the partially fermented must to arrest its alcoholic fermentation. This way, part of the grape sugars is not consumed. No additional sugar is added to the sweet wine, it is not sweetened, and only contains the sugars proceeding from the initial must that did not ferment. The thus obtained wine presents primary aromas proceeding from the fruit and secondary aromas obtained during the fermentation. Not riped in wooden barrels. Referring to the new Regulation of the Designation of Origin Málaga, we can define this wine as Naturally Sweet Málaga Wine. Pale. Alcoholic degree 15%. Reducing sugars less than 124 g/l. 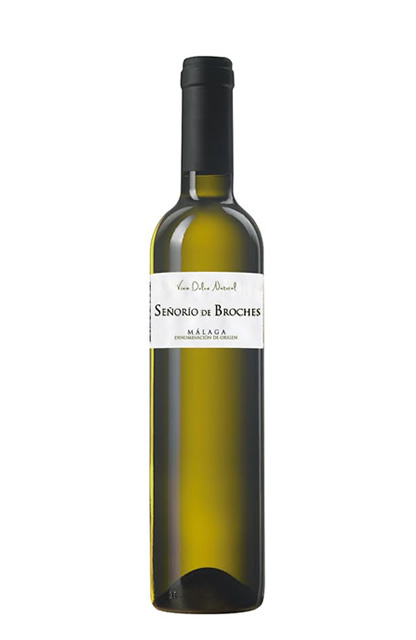 Pale yellow with touches of green, brilliantly clear and very lively in the glass. The wine’s nose is characterised by its olfactory intensity; its fragrances of pineapple, papaya, the scent of dried figs, cake and balsamic notes make it a complex and seductive wine. The mouth feel offers a good quality and well-balanced acidity, suggestive from the start to the very end. Ideal serving temperature between 10 and 15 ºC. Drink it as an aperitive with tapas, snacks, etc. Also with melon and ham salad, foie gras, etc. As a dessert wine with fruit, ice-cream, sorbets, tarts, blue-veined cheese, goat’s cheese and any cheese with a strong smelling cheese.